TALOS was a giant, bronze automoton--a living statue forged by the divine smith Hephaistos (Hephaestus). According to others he was instead the last of the ancient bronze race of man. Zeus gave Talos to his lover Europa after delivering her to the island of Krete (Crete). The giant was given the task of patrolling the island and circled it three times a day, driving off pirates with volleys of rocks. He was eventually destroyed by Poeas or the Dioskouroi (Dioscuri) twins with the aid of the magic of the witch Medea as he tried to prevent the Argonauts from the landing on the island. In the genealogy of the ancient epic poet Cinaethon, Talos was the Kretan (Cretan) god of the sun, a son of Kres (i.e. the island of Krete), and the father of the fire-god Hephaistos. He was probably also the brother of Kretan moon-goddess Pasiphae, the wife of King Minos. The word talôs means "sun" in the Kretan dialect, but "cut down" or "hewn" in the mainland Greek dialects. In classical art Talos was depicted as a handsome young man carved of bronze. "After they [the Argonauts] left [the island of] Anaphe they were prevented from landing at Krete (Crete) by Talos. 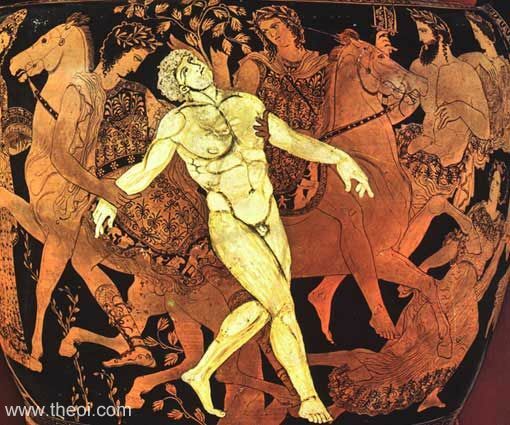 This creature some say was once of the bronze generation and was actually a bronze man; others hold that he was given to Minos by Hephaistos (Hephaestus) and was a bull. He had one blood vessel that extended from his neck down to his ankles, the lower end of which was held in place by a bronze stud. This Talos would run round the island rapidly three times a day as a security patrol, and in that capacity, when he saw the Argo sailing toward the shore, he threw stones at it. He died from the deceits of Medeia (Medea), who some say drove him mad with drugs; others allege that she promised to make him immortal and then removed the stud, so that his ichor all flowed out and he expired. Still others say that an arrow from Poeas in the ankle finished him." "From that point they [the Argonauts] were to cross to Krete (Crete), the greatest island in the sea. But when they sought shelter in the haven of Dikte (Dicte) they were prevented from making fast to the shore by Talos, a bronze giant, who broke off lumps of rock from the cliff to hurl at them. A descendant of the brazen race that sprang from ash-trees, he had survived into the days of the demigods, and Zeus had given him to Europa to keep watch over Krete by running round the island on his bronze feet three times a day. His body and his limbs were brazen and invulnerable, except at one point: under a sinew by his ankle there was a blood-red vein protected only by a thin skin which to him meant life or death. They took the ship out of range, as Medeia had asked, and rested on their oars waiting to see what marvellous device she would employ. Medeia went up on the deck. She covered both her cheeks with a fold of her purple mantle, and Iason (Jason) led her by the hand as she passed across the benches. Then, with incantations, she invoked the Keres (Spirits of Death), the swift hounds of Hades who feed on souls and haunt the lower air to pounce on living men. She sank to her knees and called upon them, three times in song, three times with spoken prayers. She steeled herself of their malignity and bewitched the eyes of Talos with the evil in her own. She flung at him the full force of her malevolence, and in an ecstasy of rage she plied him with images of death. Is it true then, Father Zeus, that people are not killed only by disease or wounds, but can be struck down by a distant enemy? The thought appals me. Yet it was thus that Talos, for all his brazen frame, was brought down by the force of Medeia's magic. He was hoisting up some heavy stones with which tow keep them from anchorage, when he grazed his ankle on a sharp rock and the ichor ran out of him like molten lead. He stood there for a short time, high on the jutting cliff. But even his strong legs could not support him long; he began to sway, all power went out of him, and he came down with a resounding crash. Thus a tall pine up in the hills is left half-felled by the woodman's sharp axe when he goes home from the woods, but in the night is shaken by the wind, till at last it snaps off at the stump and crashes down." "Kinaithon (Cinaethon) [Spartan poet C8th B.C.] too in his poem represents Rhadamanthys as the son of Hephaistos (Hephaestus), Hephaistos as a son of Talos, and Talos as a son of Kres (Cres) [i.e. the island of Krete]. The legends of Greece generally have different forms, and this is particularly true of genealogy." "Sardanios gelos. Sardonic laugh. A proverb applied to those laughing at their own death . . . Simonides [poet C6th B.C., frag 202A] says that when the Sardinians did not wish to hand over to Minos Talos, the crafted man, the latter leapt into a fire, being made of bronze, and, clasping them to his breast, killed them with their mouths open." Cinaethon, Fragments - Greek Epic C8th B.C.